SEATTLE: Something extraordinary could happen later this week: Folks might start using Microsoft and “cool” in the same sentence again. CED Solutions provides training and certification for Windows 8 courses and Windows Server courses. Windows personal computers, running Office programs, remain integral to the modern workplace. Yet Apple and Google routinely slam-dunk the world’s largest software company when it comes to pop-culture adulation. Little wonder investors on Wall Street have punished Microsoft — pushing shares up less than 11% in the past three years — for letting its chief rivals shape and dominate the hot new markets for mobile computing devices that work by touch. People may rely on PCs to get work done, but they pursue their passions on their iPads, iPhones, Kindle Fires and Android phones. Now Microsoft’s chief executive and irrepressible pitchman, Steve Ballmer, is about to launch a daring strategy to regain esteem for Windows-rooted computing: At 12:01 a.m. ET on Friday, Windows 8 desktops, laptops, notebooks and the all-new Surface touch tablet will go on sale worldwide. Much must fall into place. First, millions of Windows users need to negotiate the great leap to working with a mouse and keyboard — plus touchscreen commands — in a bold new Windows 8 interface that revolves around interactive tiles, instead of static lists and icons. Assuming that comes off without a hitch, Ballmer exudes confidence that the public will go gaga over Surface — Microsoft’s long overdue answer to Apple’s iPad. Hundreds of thousands of Micro-soft’s partners — the legions of software developers, hardware makers and independent software resellers that make up the company’s vaunted “ecosystem” — would, in turn, prosper. That includes computer-chip makers Intel and Advanced Micro Devices and hardware giants Dell and Hewlett-Packard, which, at the moment, are struggling with anemic global demand for traditional Windows PCs. However, bold steps imply big risks. Adding pressure is the fact that Ballmer’s wager follows the winning bet laid down a couple of years ago by Apple’s late chairman, Steve Jobs, who gambled that the public was ready for an innovative computing device, featuring a touch interface and long battery life, that worked much differently than Macintosh computers. Apple has shipped more than 84 million iPads since 2010, including 28.8 million in the first half of this year, according to research firm IDC. It commands a 68% share of the fast-emerging touch tablet market, where Google’s Nexus 7 and Amazon’s Kindle Fire have been grabbing attention. The success of the iPhone and iPad has pushed Apple’s worth — its share price multiplied by the number of outstanding shares — to $572 billion, making it the most-valuable company in the world and more than double Microsoft’s market capitalization of $241 billion. Part of Apple’s overall success can be attributed to Jobs’ decision to “keep a rigid line” between Mac OS, the computer operating system for Mac desktops and laptops, and iOS, the separate system Apple created for iPads and iPhones, says Charles King, principal analyst at research firm Pund-IT. Macs remain mouse-and-keyboard-driven, while iPads and iPhones use the iOS touch-screen interface. By supporting two distinct systems, Apple effectively stemmed the “cannibalization of higher-cost products by cheaper, lower-margin phones and tablets,” King says. On paper at least, Windows 8 should make Microsoft’s cash-cow Office workplace software even more profitable. Office, already the world’s most widely used suite of clerical and presentation programs, will be extended to Surface tablets and Windows smartphones. Not surprisingly, Office is being outfitted with deep hooks in Windows 8. Microsoft should also be better positioned to profit from Bing search, Xbox Live entertainment, Skype on Windows Phone and an ever-expanding menu of new Microsoft online services. Windows 8 should help deliver these new revenue-generating services to all sizes of computing devices. This “beautiful hardware … will light up with our consumer cloud services,” Ballmer wrote in an Oct. 5 open letter to Microsoft shareholders, customers, partners and employees. At least that’s the plan. Wall Street has heard similar promises for years. Microsoft initially entered the consumer Internet space some 17 years ago with the launch of its MSN portal. Yet today, its online services division, made up of Bing and MSN, accounts for just 3.9% of annual revenue and posted $8.1 billion in operating losses in fiscal 2012, which ended June 30. Ballmer dreams of the day when Microsoft is able to profitably sell online services and Web advertising at the same scale it currently sells Windows and Office software. He can afford to be patient. The company has a lock on a $74 billion-a-year business selling licenses to use Windows PCs, servers and tools, as well as individual copies of Office. This endeavor is highly profitable and has grown reliably year-after-year for more than two decades, enabling Microsoft to sock away $66.6 billion in cash and short-term investments. That’s why Ballmer is as bullish as ever about the future. “When we look back, I believe this will be the year that we expanded and redefined, fundamentally, what personal computing is really all about,” Ballmer says. To jump-start things, he has informed Microsoft’s 94,000 employees that each will be getting a Surface tablet, a new Windows Phone 8 and a new Windows 8 work PC. Yet Wall Street could quickly lose patience should Windows 8 and the Surface illicit a lukewarm response. Seattle-based Smead Capital Management, for instance, held a large block of shares from 2006 through 2011, partly based on a plea Ballmer made at a 2006 financial analyst briefing in which he promised to deliver “new profit centers” from online services, says CEO Bill Smead. Smead contends Microsoft should be paying a bigger dividend to shareholders instead of stashing cash for executives to use on risky bets. He’d like to see the company spin off Bing and Xbox Live, as it did online travel service Expedia, and fears it may be too late for Surface to get a foothold in a market dominated by the iPad. “Now another company owns the customers, and they’re going to have to be pried away,” Smead says. 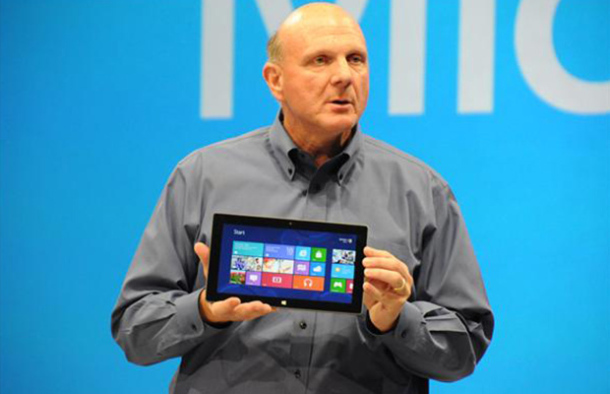 The quickest way for Ballmer to silence his critics — and establish his legacy — would be if Windows 8 and Surface emerge as big hits. And on the eve of an extravagant launch party, scheduled for Thursday in New York City, there’s ample reason to buy into Ballmer’s victory scenario. Mark Moerdler, senior analyst at Bernstein Research, believes many consumers will take Surface for what it enables them to do, and not directly compare it with the Windows look with which they are familiar. “For a portion of the current tablet market — and those who today don’t own a tablet because it cannot do enough — Windows 8 should be compelling,” Moerdler says.